When you choose to index permissions associated with EMC Documentum items, the Coveo connector needs a security provider. When permissions are indexed, in Coveo search results, a user searching for EMC Documentum Server content only sees the content to which he has access in EMC Documentum. 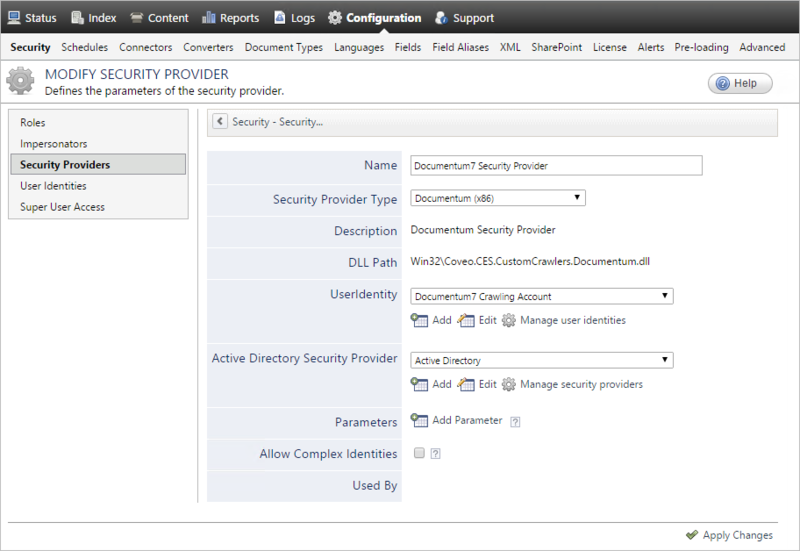 Select the Documentum user identity that you created previously (see EMC Documentum Connector Deployment Overview) . When the user names in your Documentum instance match the usernames in your Active Directory (AD) and you want to allow AD users to see Documentum items in search results, in the drop-down list, select Active Directory to allow this Documentum security provider to map Documentum permissions to AD users (see Configuring an Active Directory Security Provider). Note: If your Documentum and AD usernames do not match, contact Coveo Support for assistance with other methods to map users or use the ForceADDomain hidden parameter. Enter a value to overwrite the domain value when CES expands users to Windows users. The default value is null. Example: When the ForceADDomain parameter value is MyCompany and you expand the Documentum user John, the security provider will expand this user to the AD user MyCompany\John. Configure and index a Documentum source (see Configuring and Indexing an EMC Documentum Source).